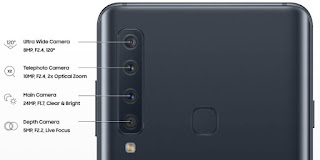 Just when you thought the triple rear camera setup on smartphones like the Huawei P20 Pro, Samsung Galaxy A7 2018 or the recently released LG V40 ThinQ is crazy enough, Samsung has just unveiled the world's first quad rear camera smartphone which is the Galaxy A9 2018. 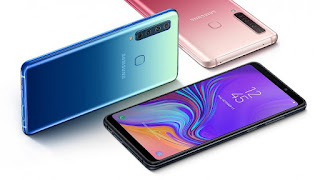 The new Samsung Galaxy A9 (2018) comes with a 6.3-inch Samsung's Super AMOLED display with a resolution of 1080 x 2220 pixels and an aspect ratio of 18:9. The device also runs on Android 8 Oreo out of the box with Samsung's experience skin on it. The device is powered by Qualcomm's midrange Snapdragon 660 chipset with an octa-core processor clocked at (4x 2.2GHz + 4x 1.8GHz). It is available in two different variants which are the 6GB RAM version and the 8GB RAM version both with 128GB of internal storage which can be further expanded via the sdcard slot with up to 512GB MicroSD card. The rear camera is where the main magic happens. 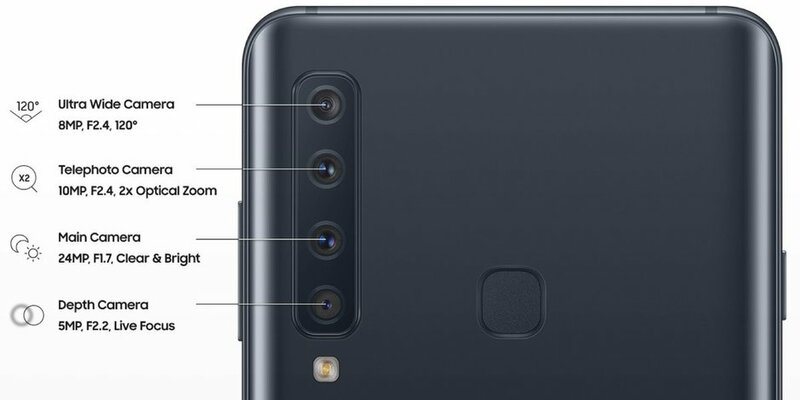 The Galaxy A9 2018 has four rear camera setup. The main camera is a 24MP shooter with F/1.7 aperture for low light shots, the second camera is a telephoto camera with 2x optical zoom and a 10MP sensor with F/2.4 Aperture. The third is an ultra wide 8MP camera with 120-degree wide-angle lens and F2.4 aperture while the fourth camera is a depth sensor with 5MP shooter and aperture of F2.2. In the front is a 24MP selfie camera with F2.0. The phone packs a pretty fair 3800mAh battery with fast charge support via the USB type C port. It's available in Caviar Black, Lemonade Blue and Bubblegum Pink colour options. The phone will go on sale next month November at a starting price of around €599 in Europe, £549 in the UK and $700 in the US.